A set of texture cards is really easy to make. Pick a shape – we’re all about lovehearts right now! – and cut lots of them out of a pice of card. Make them all the same size, and group them in pairs. Give each pair a different, paired up design. You can use pens, pencils, stickers, tissue paper, wrapping paper, whatever you have. Only decorate on one side, so that when they are face-down you can’t tell them apart. Then you’re ready to play. 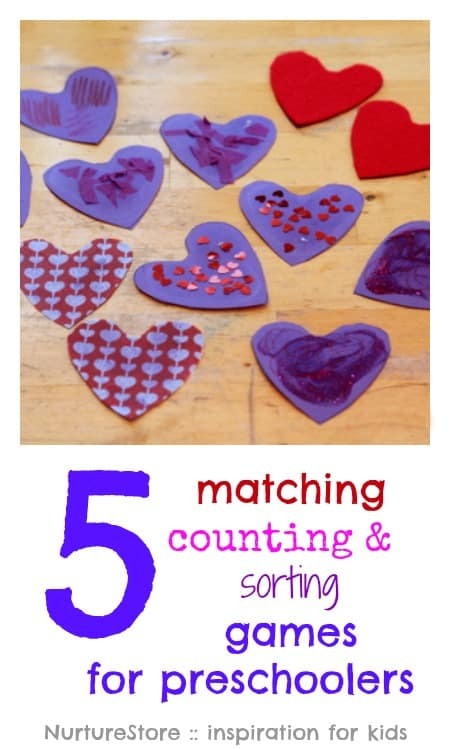 Try these five games to practise counting, sorting and matching. 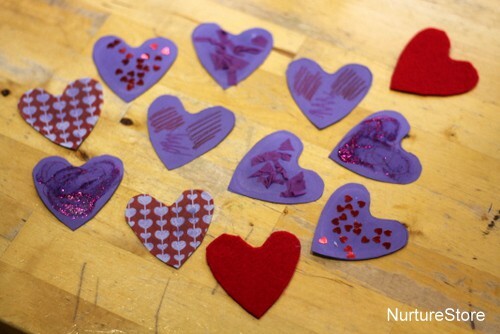 For very young children, simply count out the hearts together, pointing to each heart as you say the number out loud. By pointing as you count, you’re helping your child learn that each word number matches to another real item. Rather than onetwothreefourfive just being a chain of sounds to repeat, one means one heart, two means there is another heart now, three means there’s an extra one in the group, and so on. Count out ten hearts and then have someone run around the room/house and hide them. Then, go seek. Can you find all the hearts that have been hidden? 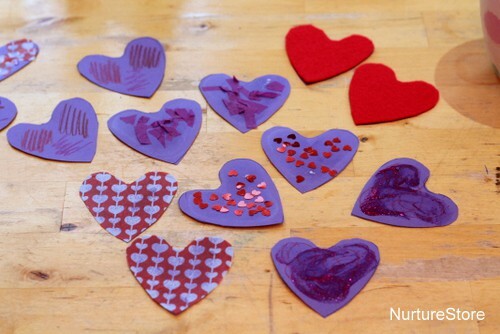 Even better, write out the numbers one to ten on a card or chalkboard, and match the collected hearts to the written numbers as you find then. This time you’re matching one more thing, with the word for the number, and the symbol for the number. 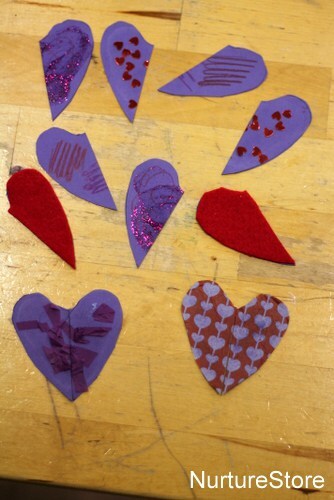 Place your texture cards out on the table or floor, so you can see all the patterns but so the hearts are all mixed up. Then see if you can sort through the group to find all the hearts that match. This works on the skills of being able to sort through lots of information, to spot patterns, and find similarities – important for both reading and maths. 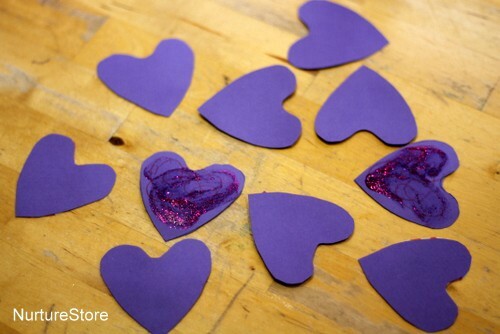 Cut some hearts in half and then place the jumble of pieces out one the table or floor. Can you find all the matching pairs and put them together? Here we’re working on sorting and matching again, plus we’re introducing the idea of fractions by putting to halves together to make a whole. For an extra challenge, you can place all the hearts face down on the floor or table. Take turns to flip over two cards. If you reveal a matching pair, you get to keep them. If they don’t match, you place them back, face down. Keep playing until all the matching hearts have been found. If you like to compete, the person with the most matching pairs can be the winner. This game continues to work on matching skills, but also on visual memory skills too, as you try to remember which pattern is hidden where. 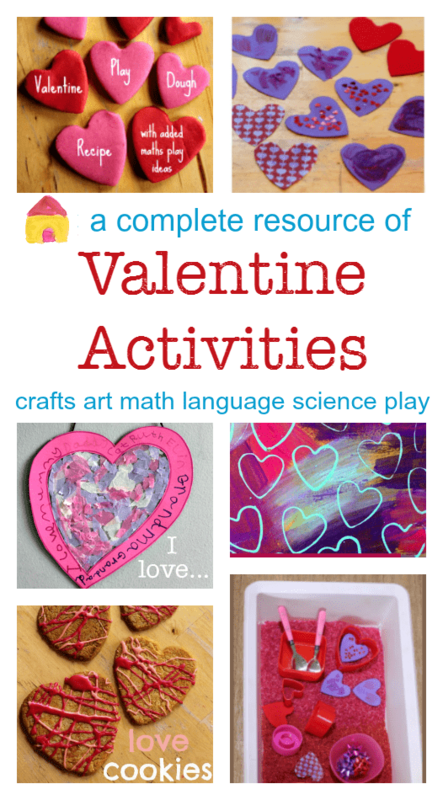 These texture hearts are a great addition to this valentine sensory tub. If you write some numbers or letters on the back of each heart, you can see if you can read them out loud when you find them in your tub.